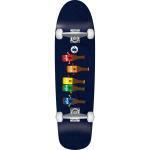 Cruiser Skateboards from Santa Cruz & Penny Skateboards Australia. Cruiser skateboards are great for getting from A to B. The shorter board length allows tigher turns and the lighter weight means they easier to carry around than a more traditional longboard. Cruisers defined skateboarding in the 1970's, perfect for rolling in style.